Many women prefer a white gold style engagement ring. It is often used as an alternative to platinum, a metal similar to the color of white gold that is much more expensive. White gold rings can come in all styles, whether it be modern or classic. 18 karat white gold is 75% gold, so it typically has a yellowish tone to it. In order for jewelry manufacturers to give it the crystal clear look, they often mix or plate it with rhodium, a hard white metal that also makes it harder and more durable for jewelry. Over time and depending on the amount of wear, white gold engagement rings may start to appear dull or worn. This is easily fixed by adding a fresh coat of rhodium to bring back the ring’s original shine and make it look as good as new. The price for a white gold engagement ring varies significantly, mostly depending on the size of the diamond on top of it and the types of metals mixed with the gold. A ring made with platinum and an identical ring made with white gold will have about a $1,000 difference. White gold rings are typically in the $1-5,000 range, but most of the cost variation is due to diamonds and the type of setting they are placed in. White gold wedding bands are typically $5-1,000 depending on the percentage of gold, the type of metals it is mixed with and any designs carved into the gold. Popular white gold engagement ring distributors and brands include Tacori, Kay Jewelers, Tiffany & Co., and James Allen. These are among the most popular brands for engagement rings, including white gold settings. These manufacturers provide rings at a variety of prices and have several options when it comes to the white gold they sell. Most of them give customers the option to choose the metals mixed with their gold, which affects the pricing, quality and whether or not they will have to have the ring repaired or cleaned over time. When choosing an engagement ring size, the easiest way for you to figure out her size is to have her finger measured. All jewelers have the tools to measure ring sizes, and many women actually know their ring size already. Some rings will also fit different depending on the shape and size of the diamond, so jewelers will be able to specify whether it is recommended you get a size larger or smaller than what typically fits her finger. When looking for an engagement ring, one easy way to save money without compromising the size and quality of the ring is to get a thinner band. 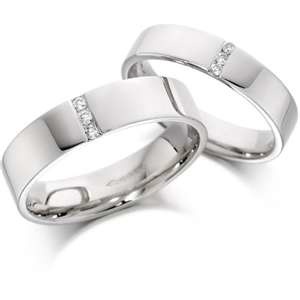 White gold bands come in a variety of widths and the thinner the band, the less expensive the ring will be. The pricing of an engagement ring is typically determined by the setting and the size and number of diamonds, so keep in mind that the price will largely reflect on the diamonds. Another way to save money on a ring is to buy a setting with less diamonds around the band. If the band is smooth, thin and is not surrounded by diamonds, the ring will be less expensive. Finding a deal on an engagement ring is something many men want to do, but do not want to be the guy that purchases a cheap quality ring. It is important to shop around for engagement rings rather than settling on the first thing you find. First of all, settling on the first thing you see is never a good idea. Secondly, even if you have in mind exactly what you want and know just what you’re looking for, you will want to shop a variety of stores and manufacturers to compare quality, warranties, prices, and any lifetime guarantees that come with the ring. Shopping online is another way to find a great deal. While you may not be able to actually talk to someone and touch and feel the ring, you will likely be able to find out all the same information with the same guarantees that give you reassurance that you’re getting a good deal and quality ring. When shopping around and trying to find what you’re looking for at the best price, don’t be afraid to ask questions. It is your money and you need to know exactly how you’re spending it. Find out if you get any warranty, if there is a lifetime guarantee, if repairs are available, and the return policy (just in case). If you’re not getting any of this for your money, you may want to continue shopping. Many men go shopping for an engagement ring with absolutely no clue as to what their girlfriend likes or wants. Others go in with a clear idea because she has made it very clear what she wants. They may be the lucky ones because if you go in absolutely clueless, you run the risk of buying a ring she absolutely hates. Even if you don’t want to straight up ask her and find out what kind of ring she would want, you can find out what she would be into. Most women wear either white gold, silver or yellow gold. They rarely mix both, so if she is usually wearing silver or white gold jewelry, your best bet is to get a ring in that style of gold as well. If she commonly wears simple jewelry that is light and elegant, a single stone setting may be for her. If she enjoys unique, flashy pieces, a ring with different shaped diamonds and cuts may suit her best. If you understand your girlfriend’s personal style and have bought her jewelry she was happy with in the past, you should be able to easily determine what she would want for an engagement ring. Jewelry sales consultants are typically very experienced in working with men who have no idea what they are looking for. They know what questions to ask about her and how to find rings that sound right for her and are still within your price range. When buying an engagement ring, you should definitely at least know the type of gold your girlfriend would like. You should also do a little research on the many types of gold and gold compositions so you can decide what will look best on her ring and what will be of the best quality that still lies within your price range. Remember that just because you’re unable to spend a lot does not mean you won’t find something that is beautiful and absolutely perfect for her.